Invasive fungal infections are a major problem in solid-organ transplant (SOT) recipients. Mucormycosis has emerged as an important invasive fungal infection in SOD and hematopoietic stem-cell transplant recipients associated with aggressive clinical course and substantial rates of death. Fungal infections in general occur in the intermediate (1–6 months) to late (more than 6 months) posttransplant period. The incidence varies according to geographical area because of environmental exposure and the effects of immunosuppressive regimens. Systemic mycosis is a significant problem in transplant patients worldwide and remains the major cause of death in these individuals. 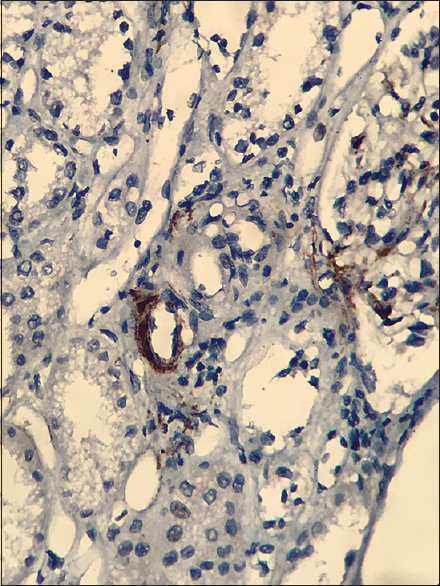 We report a case of a renal transplant recipient with hepatic mucormycosis on postmortem liver biopsy. A 28-year-old male patient suffering from chronic kidney disease Stage V underwent renal transplantation from a deceased donor. He was maintained on hemodialysis for 1½ years before transplantation. The patient received nondepleting induction basiliximab 20 mg on day 0 and day 4 and three doses of methylprednisolone. Triple immunosuppression (mycophenolate mofetil/tacrolimus/prednisolone) was given. The transplantation was complicated by delayed graft function requiring hemodialysis. Implantation kidney biopsy done on the day of renal transplantation showed features of acute tubular necrosis [Figure 1]. There was drain site leakage for which the drain was removed and placed Foley catheter at that site. Drain fluid volume progressively decreased with a sudden increase on postoperative day 30, associated with early morning fever spikes. Magnetic resonance imaging pelvis showed right loculated perinephric collection; culture was positive for pseudomonas sensitive to meropenem and cytomegalovirus – 1036 copies/ml, treated with intravenous (IV) ganciclovir in renal modified doses. Two months after surgery on follow-up, he suffered with altered behavior due to metabolic derangement with decreased serum sodium (113 mEq/L) and potassium (2.0 mmol/L) levels. The patient was readmitted in view of progressive renal failure with raising creatinine levels (1.55 mg/dl). Discharge serum creatinine was 1.4 mg/dl. Transplant kidney biopsy showed features of acute cell-mediated rejection and had received three doses of methylprednisolone. Ten days after readmission, the patient complained of increased breathlessness and tachypnea. On examination, heart rate was 130/min, blood pressure – 160/110 mmHg, respiratory rate – 32/min, bilateral crepitations present, and was treated with IV calcium gluconate 20 CC for pulmonary congestion. Laboratory investigations showed increased procalcitonin levels (57.5 ng/ml). Blood and urine cultures were negative for bacterial growth. Complete hemogram showed decreased hemoglobin (11.2 gm/dL), white blood cell (1500 cells/cumm), and platelets (53,000/cumm). Oxygen support was given by oxygen mask at 10 L/min, SpO2 was maintained at 84. The patient was further managed in respiratory intensive care unit (ICU) with mechanical ventilation and ionotrope (dopamine and noradrenaline) support for hypotension. Despite continuous monitoring and resuscitative effort, the patient expired the next day. Immediate cause of death was reported as sepsis with refractory shock, neutropenic sepsis, antecedent causes could be acute cellular rejection. Other significant conditions include complicated urinary tract infection – Acinetobacter. Later, postmortem needle biopsy was done on the liver, kidney, and lung. 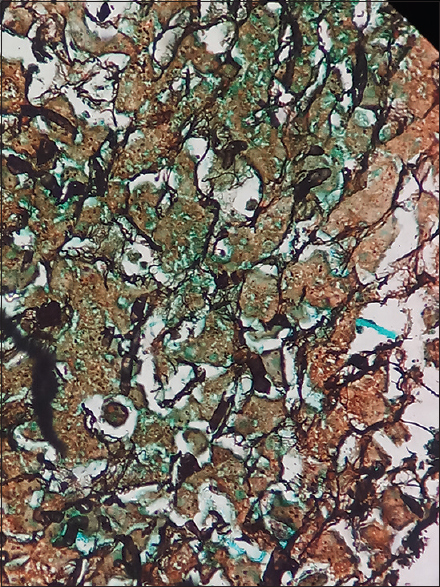 Liver biopsy showed areas of necrosis with broad, aseptate filamentous fungal hyphae [Figure 2] stained positive with Gomori methenamine silver stain [Figure 3] favoring mucormycosis. 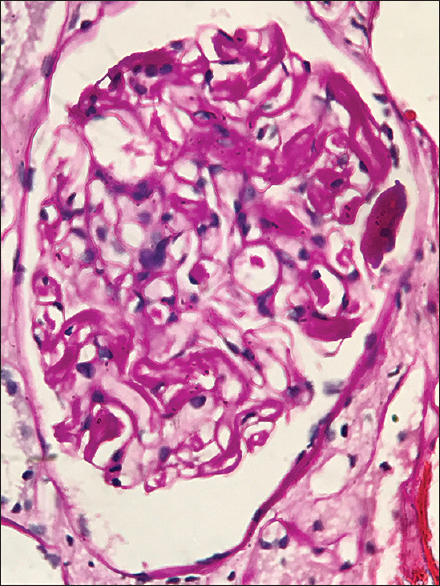 Kidney biopsy showed features of microvascular thrombosis with the presence of fibrin thrombi in the glomerular capillaries highlighted with periodic acid–Schiff special stain [Figure 4]. C4d immunohistochemistry on kidney biopsy was positive for peritubular capillaries [Figure 5]. 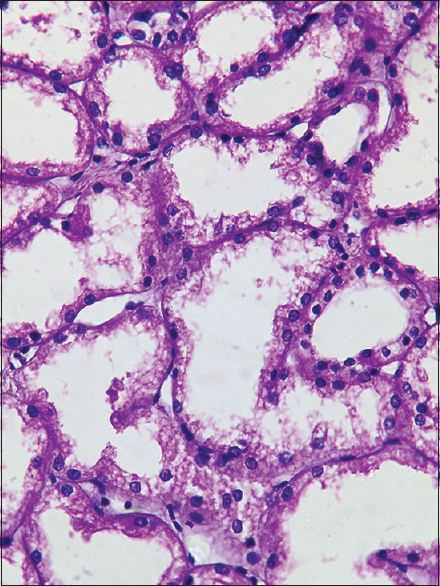 Lung biopsy showed skeletal muscle bundles and foci of necrosis. Kidney and lung biopsies are negative for Mucorales. Infections are the major cause of morbidity and mortality in renal transplant recipients. Long-term, graft-preserving immunosuppressive therapy predisposes recipients to infections, including fungal infections. Fungal infections account for 5% of all infections in renal transplant recipients. Candida and Cryptococcus species are the most frequently isolated yeasts. The recent prospective multicenter TRANSNET study in the United States found that a 12-month cumulative incidence of mucormycosis was 0.07% in SOT recipients, with mucormycosis accounting for 2% of invasive fungal infections. Most fungal infections occur in the first 6 months after transplantation due to optimum dose of various immunosuppressive medications. The incidence of fungal infection varies with the type of SOT. Liver transplant recipients have the highest reported incidence of candida infections whereas lung transplant recipients have the highest rate of Aspergillus infections. The risk of invasive fungal infections in kidney transplant recipients is low. Mucormycosis, caused by fungi of the class Zygomycetes, is an uncommon but frequently fatal mycosis in transplant recipients due to its angiophilic and thrombosis/hemorrhage-oriented characters.Rhizopus is the most common species, accounting for 35%–73% of cases followed by Mucor (13%–37%) and Mycocladus (0%–13%).Mucor is associated with mortality rate as high as 64%. Various forms of manifestations of mucormycosis in renal recipients have been described including rhinocerebral, pulmonary, gastrointestinal, cutaneous, disseminated, and kidney transplant graft. Isolated renal infection without systemic involvement has been attributed to seeding during transient periods of fungemia. Donor-derived infection through transmission with the allograft presents early after transplantation. Graft rejection necessitating augmented immunosuppression, a condition commonly encountered in renal transplant recipients, was also associated with an increased risk of mucormycosis. Transplant immunosuppressive therapy primarily targets T-cell-mediated graft rejection and allows infectious complications, leading to a high mortality rate. Calcineurin inhibitors, which include cyclosporine and tacrolimus, impair calcineurin-induced upregulation of interleukin-2 expression, resulting in increased susceptibility to invasive fungal infections. Renal failure and prior exposure to caspofungin or voriconazole, use of ureteral stents during renal transplantation, prolonged ICU stay, metabolic acidosis, corticosteroid usage, hematologic malignancies, solid-organ transplantation, deferoxamine usage, AIDS/HIV infection, IV drug abuse, and trauma/burns, trauma/burns and diabetes mellitus increase the risk of mucormycosis.,, Diabetes mellitus remains the leading risk factor among all studied patient populations through its impairment of neutrophils and macrophages, which are integral to the innate defense against mucormycosis. The infection is acquired through inhalation of spores or rarely through direct contact with the skin. The hyphae of pathogenic Mucorales are angioinvasive, which lead to hemorrhagic necrosis, vascular thrombosis, and tissue infarction. The primary site of infection varies according to the host's condition. Pulmonary infection is the predominant site affected in recipients of SOTs, accounting for 39% of cases with involvement of other organ sites in 48%. Mucormycosis occurs in patients with iron overload, as host iron availability is important for the pathogenesis of mucormycosis. Iron is a pivotal growth factor for Mucorales, and it also compromises critical host defenses against Mucorales. 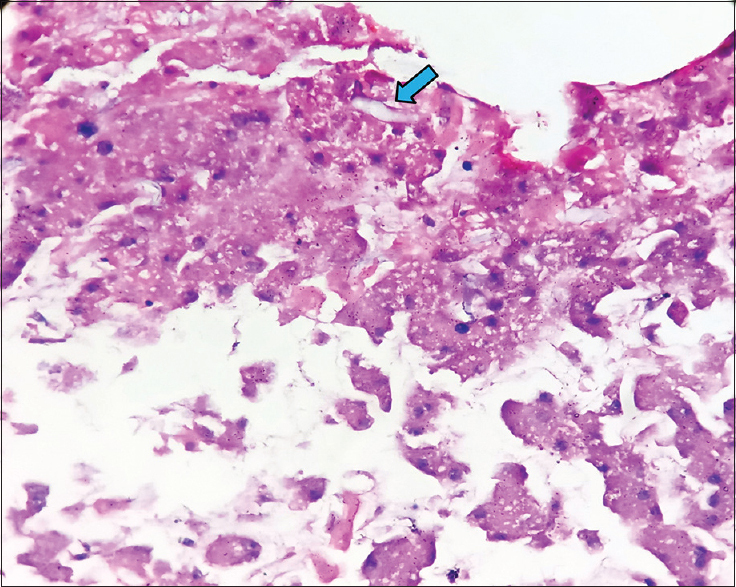 Diagnosis of mucormycosis is based on a high index of suspicion, along with a combination of appropriate imaging, histopathologic identification, microbiology, and newer molecular diagnostic tests. Tissue biopsy is needed to confirm the etiological diagnosis, and direct identification of the organism by culture or histopathology is the gold standard. Molecular diagnostic tests for identification of Mucorales are increasingly used for early detection of infection and identification of genus even in cases where the histopathology is suggestive of Mucorales, but the cultures are negative. Qualitative and quantitative polymerase chain reaction has been used to detect infection in lung tissue, bronchoalveolar lavage fluuid, and serum samples. Timely diagnosis and treatment are crucial due to the aggressive course of mucormycosis that may eventually lead to tissue necrosis and dissemination. The optimal management of mucormycosis is based on early recognition and initiation of treatment, surgical resection of necrotic tissue, and reversal of predisposing factors, such as uncontrolled hyperglycemia, immunosuppression, and neutropenia. Amphotericin B and posaconazole are the only antifungal agents currently available that are active against Mucorales. Amphotericin B is considered the drug of choice. Surgical debridement is important in localized disease. The role of combination therapy and newer agents such as isavuconazole therapy remains to be defined. Despite early diagnosis and treatment, graft loss and mortality rate remain high in patients with disseminated disease. Prognostically invasive fungal infections are associated with increased morbidity and mortality in renal transplant patients. Nearly 6.1% of renal transplant recipients were affected by systemic fungal infections and resulted in 63% mortality rate. The overall mortality rate among SOT recipients with mucormycosis is generally 38%–48%. Early detection and appropriate timely management of fungal infections play a decisive role in improving the survival and reducing the mortality. Mucormycosis infecting liver is a rare but serious infection in renal transplant recipients. Hence, it is important to be aware of this possible diagnosis in all immunosuppressed patients. Lanternier F, Sun HY, Ribaud P, Singh N, Kontoyiannis DP, Lortholary O, et al. Mucormycosis in organ and stem cell transplant recipients. Clin Infect Dis 2012;54:1629-36. Hamdi T, Karthikeyan V, Alangaden GJ. Mucormycosis in a renal transplant recipient: Case report and comprehensive review of literature. Int J Nephrol 2014;2014:950643. Patel MH, Patel RD, Vanikar AV, Kanodia KV, Suthar KS, Nigam LK, et al. Invasive fungal infections in renal transplant patients: A single center study. Ren Fail 2017;39:294-8. Silveira FP, Husain S. Fungal infections in solid organ transplantation. Med Mycol 2007;45:305-20. Ram R, Murty KV, Prasad N. Time table of infections after renal transplantation – South Indian experience. Indian J Nephrol 2005;15:S14-21. Mekeel KL, Hemming AW, Reed AI, Matsumoto T, Fujita S, Schain DC, et al. Hepatic mucormycosis in a renal transplant recipient. Transplantation 2005;79:1636.